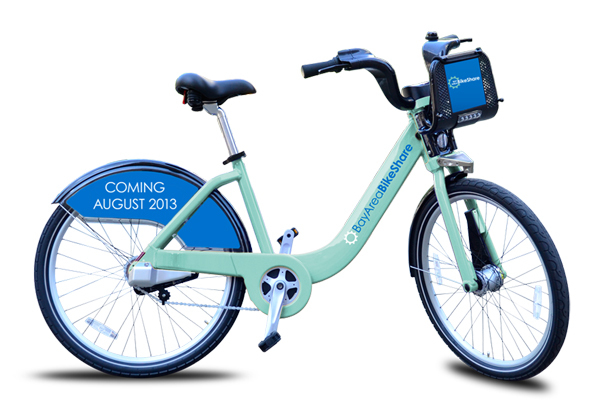 Finally, San Francisco is getting a bike share program which is launching next month. Hooray! You can now go online to purchase your membership. It’s a pilot program starting with 700 bikes at 70 stations in SF and along the Peninsula- or to be more precise it is actually just in 5 cities (San Francisco, Redwood City, Palo Alto, Mountain View and San Jose). But SF gets half of all of the bikes and half of all of the stations. That comes out to roughly 10 bikes per station. If successful, it’s going to expand to other cities including expanding to more stations and bikes in SF for a total of 1,000 bikes (still too small!) in the future. Here are some characteristics of the bike they are using that have struck me. I like the Celeste green color (easy to spot and gets motorist’s attention) and it’s refreshing. It has a step-through frame so both sexes and elders can get on the saddle easier. It looks like it may come with 7 speeds which I think is good for SF’s hills. It also comes with front and rear lights which are powered by pedaling, fenders for rain and chain guard to keep your pants clean. All in all, a typical bike-share bike which has been shown to work in other North American cities. Aside from the color, this bike is identical to the ones from Capital bikeshare in DC, Citi-Bikes in NYC, Hubway bikes in Boston, and Divvy bikes in Chicago. Celeste Green Bay Area Bike Share. The location of the stations are very good, all on flat land, and in high density areas where high tourism and business districts are. So, it looks like it aims to get visitors and workers to use them. It’s a great way to get people that are on the fence about riding a bike to actually ride one and good for short bicycle trips like running errands. It also serves as a missing link in the public transit system. I am hoping that more people coming into SF to work or play will use the Caltrain/BART and pick one of these bikes to get to their designated spot. It looks like there is one docking station at the Caltrain station and one pretty close by as well, but by going with the assumption that there are 10 bikes per station, there would only be 20 bikes. This is clearly not enough. You may become reliant on bike shares, and one day you are stuck without one. I see thousands of Caltrain riders getting off at 4th and King St. and anyone of them can use them up fairly quickly. It needs at least 40 – 100 bikes at those two locations. As for the commuters coming into the Ferry Building and Transbay Terminal, I think they also deserve more than just one station each. However, in other parts of the city, I think it will just about fulfill the level of need initially. For example, there are 9 docking pods on Market St. with a few other ones a block or two away. I think the spacing between pods are appropriate too. This area will serve the riders coming out of the BART stations well which are located along Market St. Moreover, there are people that don’t like to lug around a bike and a heavy lock, especially when they have to take them on MUNI buses. These bike shares would nicely fit the bill. In addition, these bike shares can benefit cyclists who own expensive bikes that they don’t want to risk getting stolen when locking their bikes outside. I usually don’t like taking my bike (even my cheapee one) to the Metreon to watch a movie or to go to the Westfield mall where I won’t see my bike for hours, so this would be beneficial for people like me. 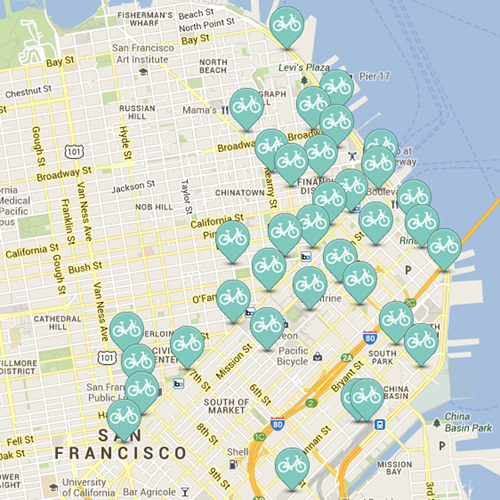 Map of bike-share stations in SF. Regarding the pricing scale, it is a little expensive if you’re getting the 24 hours or 3 days membership. It comes out to be more expensive than riding MUNI. The unlimited 30 minutes free trips I think it’s kind of a short time span, especially when you only have 35 stations around and not one in every location. It will be a hassle if you want to go more than 2 miles which could take more than 30 minutes. And what if you need to make multiple errands in one trip. Pricing for annual and short term memberships. Surely, the overtime fees are pretty expensive at $4 for the second 30 minutes and $7 for each additional 30 minutes. They definitely want you to return the bike. This is not meant for you to rent it for the weekend or a day. In those situations, it’s best to rent from a regular bike rental shop. Overtime fees if you don’t return the bike within 30 minutes. Bike shares usually don’t come with helmets. So it will be up to riders to bring their own, but I don’t expect many to do so based on observations from other American cities that have bike share programs. It’s going to be nice to see people in regular clothing riding them as opposed to people in spandex and athletic wear. They will be “upright and helmetless.” I think this is going to change the image of cyclists and the convenience that the bike share will provide is going to increase the cycling rate. Yay for bike share!